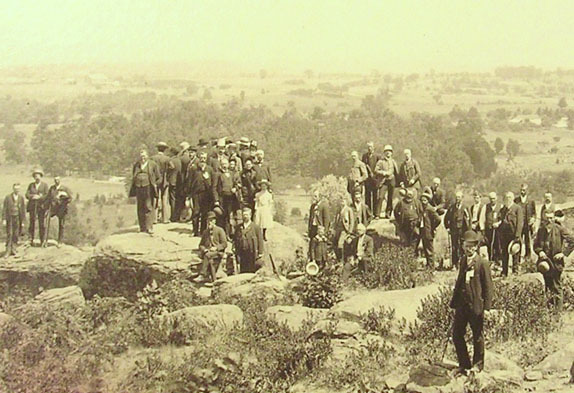 Visitors on Little Round Top. The Warren Statue was erected on a boulder to the left a month after this picture was taken. Courtesy of Gettysburg National Military Park. This view was taken facing northwest in July, 1888. A native of the Chicago area, Garry Adelman earned his B.A. in business from Michigan State University and his M.A. in history at Shippensburg University of Pennsylvania. He is the author or co-author of Antietam: Then & Now (2005), The Myth of Little Round Top (2003), The Early Gettysburg Battlefield (2001), Little Round Top: A Detailed Tour Guide (2000), and Devil’s Den: A History and Guide (1997). He has published articles in The Gettysburg Magazine and the Civil War Preservation Trust’s Hallowed Ground and has served as editor for several Civil War image booklets. 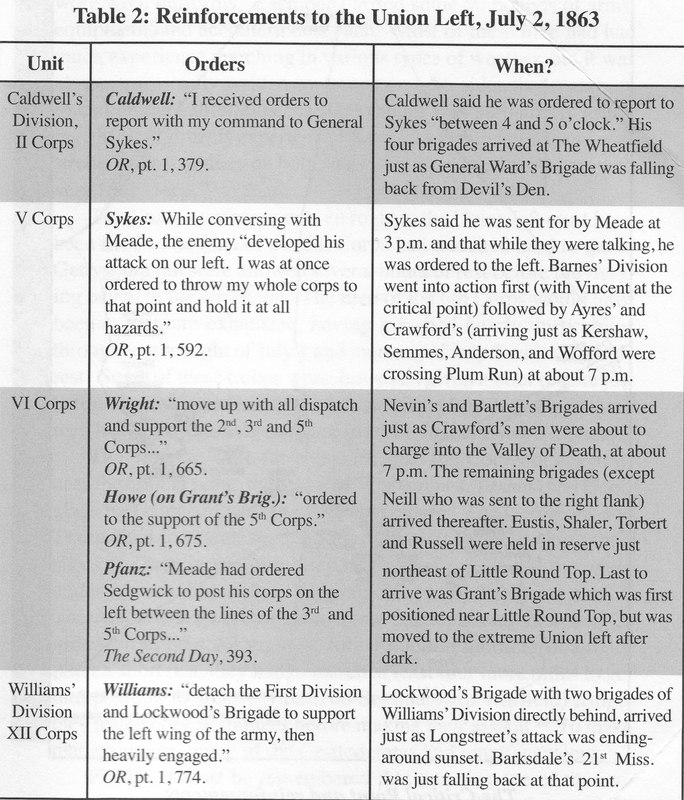 He conceived and drafted the text for wayside exhibits at the Third Winchester, First Day at Chancellorsville, Cedar Mountain and the Slaughter Pen Farm battlefields. A frequent lecturer at Civil War Round Tables, he has also appeared as a speaker on the History Channel, C-Span, and Pennsylvania Cable Network. He is the vice president of the Center for Civil War Photography and a Licensed Battlefield Guide at Gettysburg. His The Civil War Then & Now: War in the East will be published in 2011. He works full time as a historian at History Associates Incorporated in Rockville, MD and in April 2010 will become the Civil War Preservation Trust’s full time Director of History and Education. Little Round Top is one of the most well-known historical sites in the United States. This small hill south of Gettysburg has often been called the “key” to the Union position during the battle, and some have stated that if it had fallen to the Confederates on the afternoon of July 2, 1863, the United States would have forever been split in two. Garry Adelman traces the growth of the popularity of the hill and assesses the military situation at the time when Little Round Top might have fallen into Confederate hands. 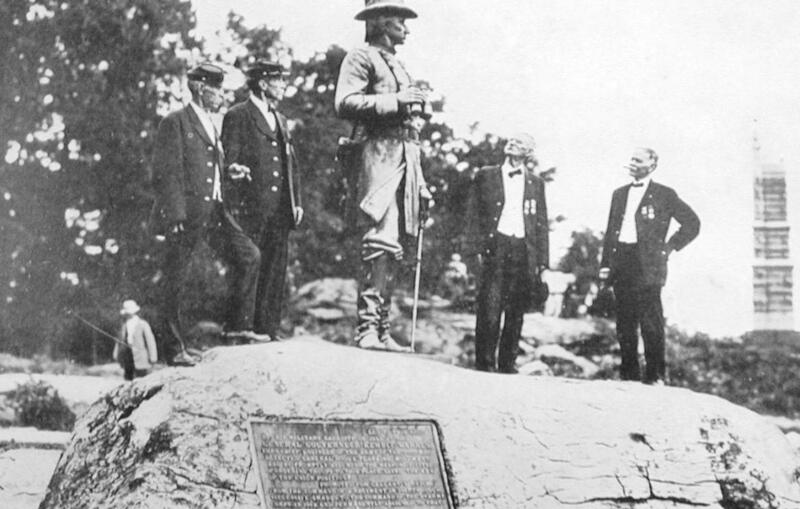 He argues that the significance of Little Round Top has been exaggerated, and even if Confederates had captured Little Round Top, they had only a small chance to hold it. In our first Myth of Little Round Top post, Garry Adelman introduced us to the series, and showed us the initial placement of soldiers and Confederate assaults on the southwest face of Little Round Top. 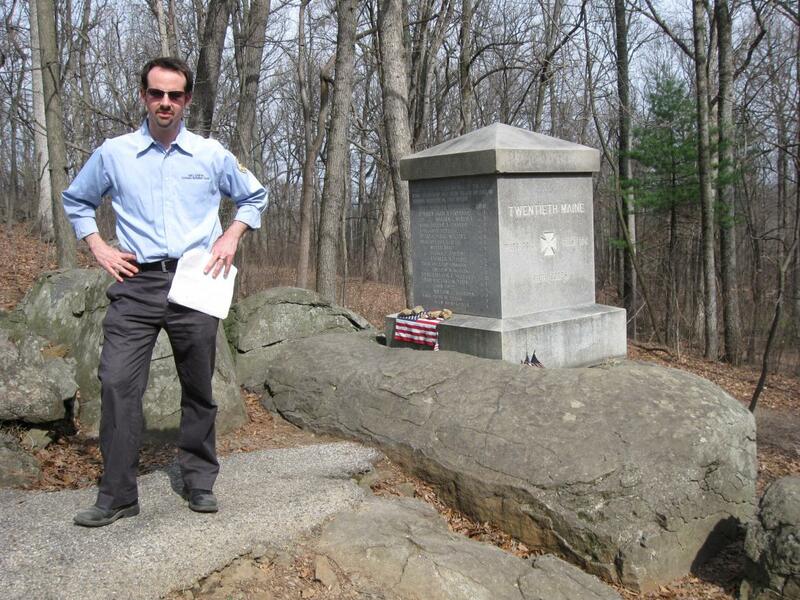 In our second post, Gettysburg Licensed Battlefield Guide Garry Adelman showed the attack on the 20th Maine Infantry, and explained how the Little Round Top legend slowly grew over time. In today’s post, Gettysburg Licensed Battlefield Guide Garry Adelman continues his story of how Little Round Top’s importance grew over time, and showed us the strength of both armies at this critical point on the evening of July 2, 1863. 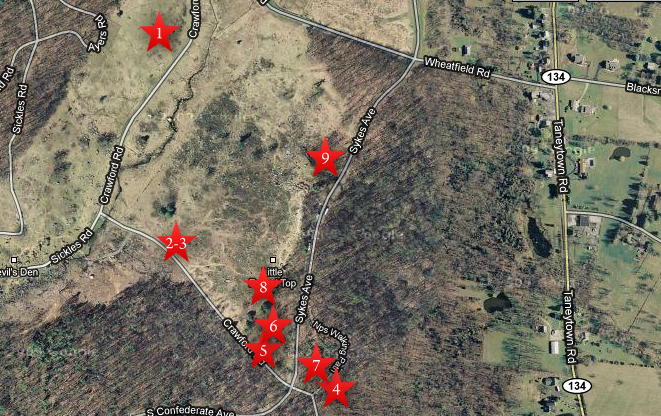 This map shows us the locations taken of the videos for The Myth of Little Round Top series. Video #1 was taken on Houck’s Ridge near Ayres Avenue. Videos #2 and #3 were taken on Warren Avenue, which is mislabeled Crawford Avenue on this Google Map. Video #4 was taken southeast of the monument to the 20th Maine Infantry Regiment. Video #5 was taken south of the 83rd Pennsylvania Infantry monument, near Warren Avenue. Video #6 was taken near the monument to the 83rd Pennsylvania Infantry Regiment. Video #7 was taken near the monument to the 20th Maine Infantry Regiment. Video #8 was taken below/south of the monument to the 44th New York Infantry Regiment. Video #9 was taken on the north side of Little Round Top near the monuments to the 146th New York Infantry Regiment, and the 155th Pennsylvania Infantry Regiment. This map was created facing north at approximately 7:00 PM on Tuesday, March 29, 2010. Gettysburg Licensed Battlefield Guide Garry Adelman is the host for our Myth of Little Round Top series. He has been a Licensed Battlefield Guide since 1995. He is on the south side of Little Round Top near the monument to the 20th Maine Infantry Regiment. This view was taken facing northeast at approximately 3:15 PM on Sunday, March 21, 2010. In Video #7 (Videos #1-#6 were shown in our previous posts) Gettysburg Licensed Battlefield Guide Garry Adelman presents how the Myth of Little Round Top grew over the years including Michael Shaara’s book, The Killer Angels, the Ken Burns PBS Civil War series, and the Gettysburg movie. This view was taken facing northeast to south to east at approximately 3:15 PM on Sunday, March 21, 2010. Veterans on the Warren Rock. Visitors are prohibited on the rock, but Civil War veterans got a free pass! From Pennsylvania at Gettysburg, Vol. 3. This view was taken facing southeast in 1913. 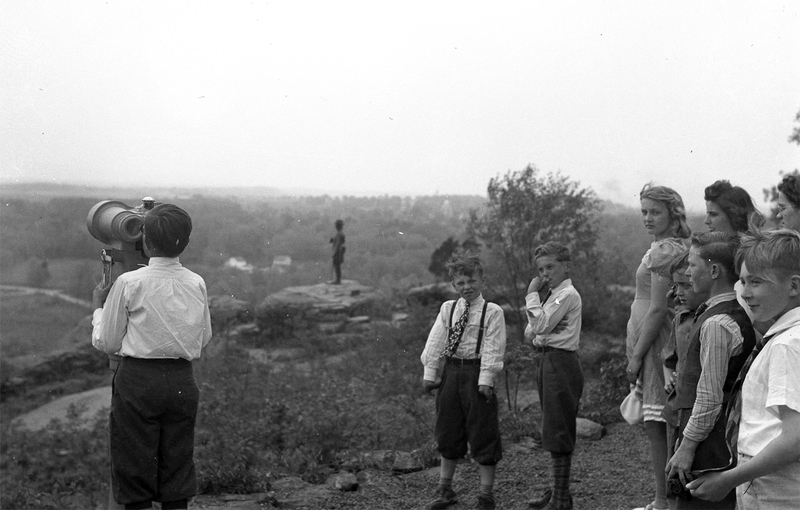 Children on Little Round Top. The story of Little Round Top they learned was most likely considerably different than that learned by kids 50 years earlier or 50 years later. Courtesy of the Center for Civil War Photography. This view was taken facing northeast circa 1940. 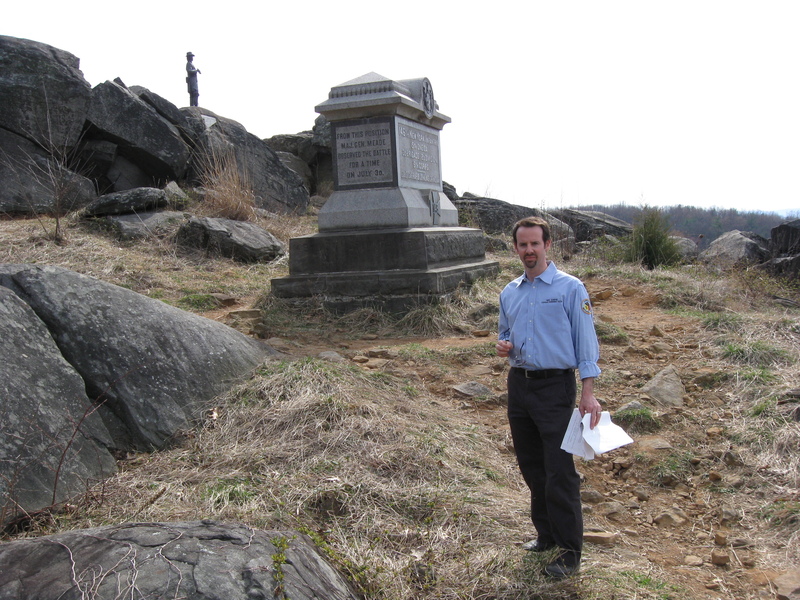 Licensed Battlefield Guide Garry Adelman has now moved closer to the summit of Little Round Top. The monument to the 44th New York Infantry Regiment is behind the photographer. The monument to the 16th Michigan Infantry Regiment is being presented to the viewers by Garry. The Slaughter Pen and Devil’s Den are beyond the monument to the 16th Michigan. This view was taken facing southwest at approximately 3:15 PM on Sunday, March 21, 2010. In Video #8 Licensed Battlefield Guide Garry Adelman focuses on two critical points on Little Round Top at approximately 6:00 PM on July 2, 1863: The fighting around the position of the 16th Michigan, and the fighting at the position of the 20th Maine. Garry’s starting to get a little worked up here, but it’s nothing like when we show you Myth of Little Round Top #4. This view was taken facing southwest to southeast to south to southwest to northwest to southwest at approximately 3:15 PM on Sunday, March 21, 2010. 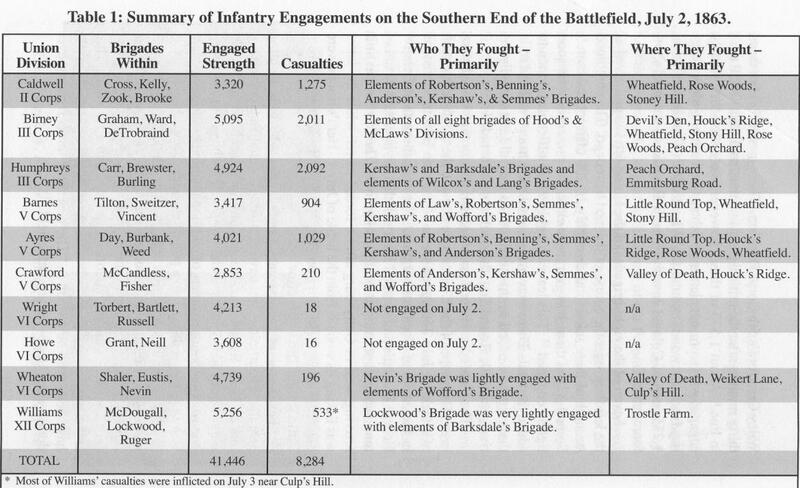 This chart, from Garry Adelman’s book, The Myth of Little Round Top, shows the strength of the Union’s Army of the Potomac in the area of Little Round Top on the early evening of July 2, 1863. This chart was created by Garry Adelman in 2000. This chart, from Garry Adelman’s book, The Myth of Little Round Top, shows the strength of the Confederate’s Army of Northern Virginia in the area of Little Round Top on the early evening of July 2, 1863. This chart was created by Garry Adelman in 2000. 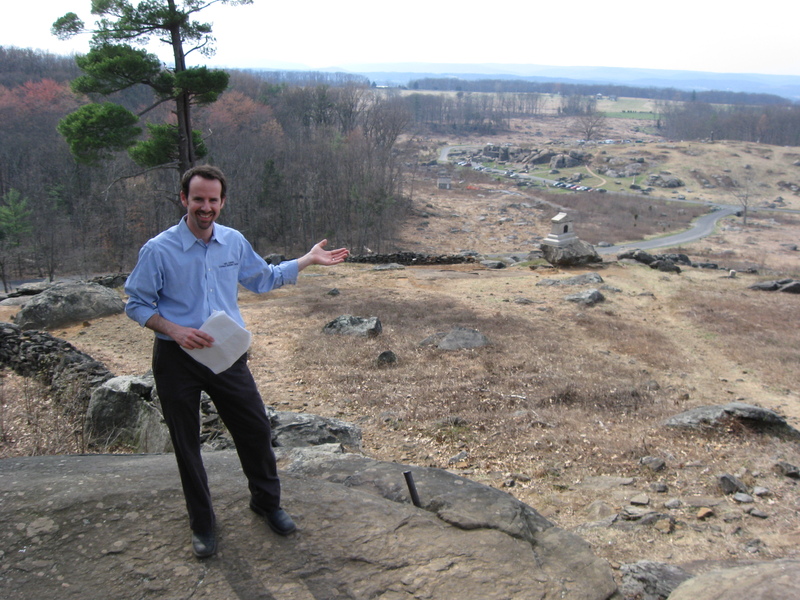 Garry Adelman is standing on the north side of Little Round Top. At the top of the hill is the monument to Brigadier General Gouverneur K. Warren. Directly behind Garry is the monument to the 146th New York Infantry Regiment. This view was taken facing south at approximately 3:15 PM on Sunday, March 21, 2010. In Video #9 Garry Adelman explains how Union soldiers in this area the evening of July 2, 1863 have a significant advantage over the Confederates in numbers of men, amount of ammuntion, and the “freshness” of their soldiers. This view was taken facing south to southwest to west to northwest to northeast to north at approximately 3:15 PM on Sunday, March 21, 2010. 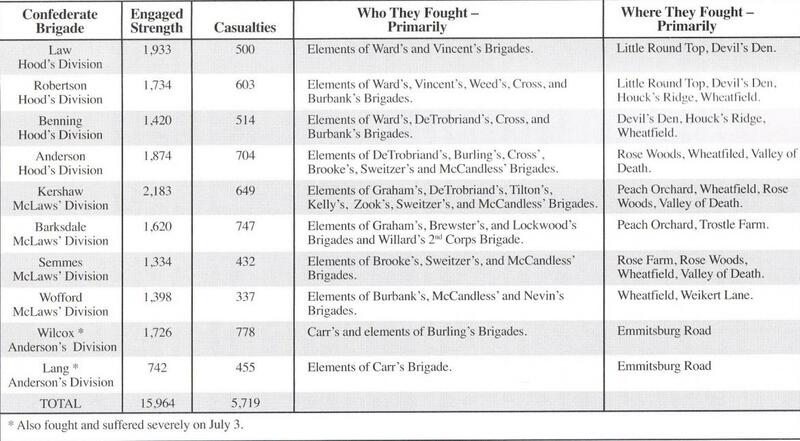 This chart, from Garry Adelman’s book, The Myth of Little Round Top, shows the for the Union forces available in the area of Little Round top on the evening of July 2, 1863. This chart was created by Garry Adelman in 2000. 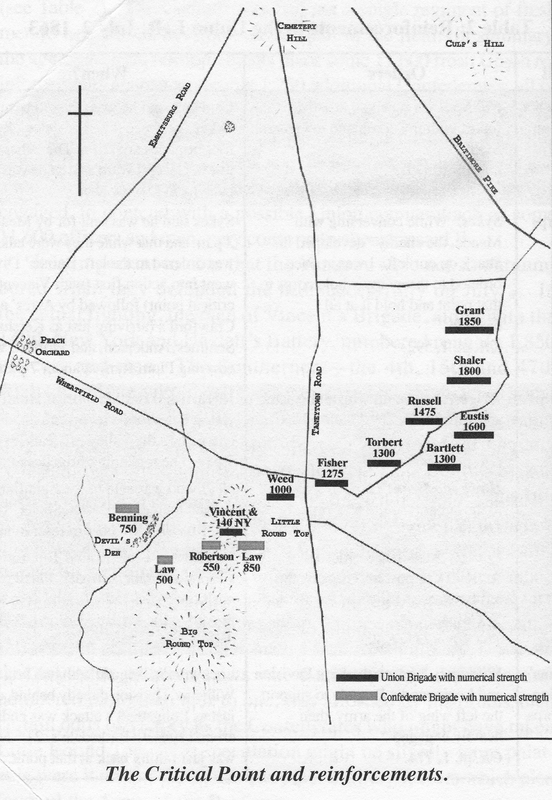 This map, from Garry Adelman’s book, The Myth of Little Round Top, shows the position and strength of the Confederate and Union forces available in the area of Little Round top on the evening of July 2, 1863. This map was created by Garry Adelman in 2000. 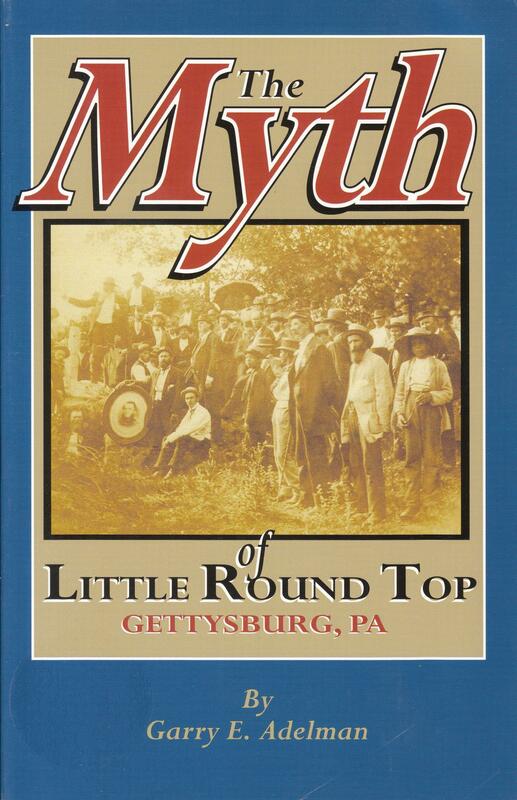 Garry’s book, The Myth of Little Round Top, was published by Thomas Publications, Gettysburg, Pennsylvania, in 2003. For ordering information, please click this link. 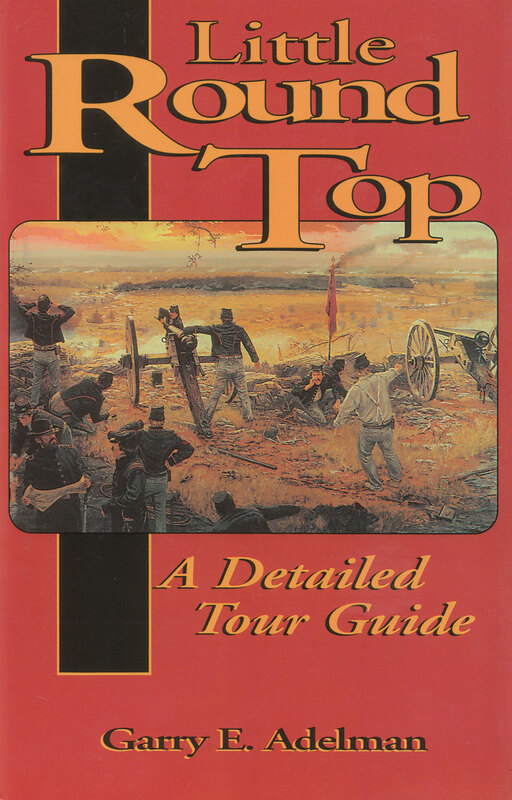 Garry’s book, Little Round Top: A Detailed Tour Guide, was published by Thomas Publications, Gettysburg, Pennsylvania, in 2000. For ordering information, please click this link.